We’ve got a lot of smart grid news emerging from this week’s DistribuTECH show in San Antonio, Texas, including a big new customer for smart grid networking startup Silver Spring Networks. That’s Progress Energy, which has hired Silver Spring to deploy smart meters and manage direct load control devices in Florida and North and South Carolina, and to control it all over the Redwood City, Calif.-based company’s UtilityIQ platform. The two companies didn’t disclose how many meters would be involved or the dollar value of the project. But Progress has about 3.1 million customers, and its work with Silver Spring is part of a “next-generation demand response” program partially funded by a $200 million Department of Energy stimulus grant (PDF), which indicates that it could be a sizable project. It’s also one of the first projects in which Silver Spring will concentrate on commercial and industrial customers, rather than homes, Marketing Director Lisa Magnuson told me Wednesday. Most of the startup’s massive smart meter deployments with the likes of Pacific Gas & Electric, Florida Power & Light, Pepco and others have been residential, though it is doing some high-rise metering in Chicago as part of its work with Commonwealth Edison. --Speaking of high rises, Silver Spring was demonstrating some cool mapping applications at its DistribuTECH booth, using smart grid data it has uploaded to Google Earth. Those included three-dimensional views of how its meters mesh in a Chicago skyscraper, as well as a graphical overlay of voltage sags and surges recorded by meters in Florida -- one example of how smart meters can pull data beyond energy usage that’s useful for utilities. Another interesting map presented a time-lapse view of a recent lightning storm in the city and recorded how Silver Spring-enabled meters sent outage signals to the utility, then sent “all-clear” messages once they were reconnected to power via automated grid systems -- along with a few neighborhoods where the meters remained off because lightning had damaged the grid. 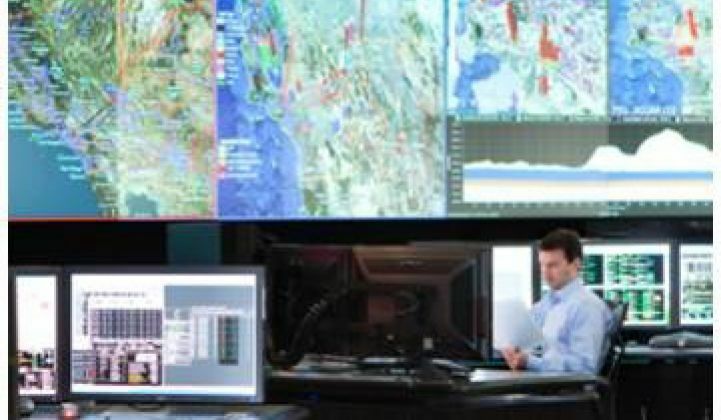 Linking GIS systems and smart grid operations platforms is an interesting new field, with contenders like Space-Time Insight and SAIC smart-grid-as-a-service partner Esri Technology integrating tons of data with mapping overlays to help utility operators better manage their smart grid systems. Mark Donsky, the Silver Spring senior manager of product management who was overseeing the DistribuTECH demo, said that the company has begun to integrate its Google Earth-enabled mapping capabilities for clients like PG&E. --Another interesting partnership announced Tuesday is between SAIC and C3, the enterprise carbon and energy management software company founded by Siebel Systems’ Tom Siebel. The goal of the partnership is a “fully integrated energy solution” for commercial, industrial and government customers, including energy forecasting and procurement and project design and implementation, according to a press release. C3 has been quite stealthy about the specifics of its platform, but has announced a partnership with HP to bring consulting services to corporate clients. SAIC, for its part, is offering smart-grid-as-a-service aimed at smaller utilities, which brings it into competition with service platforms from the likes of GE and Lockheed Martin, as well as partnerships like the one recently announced between Aclara and Calico Energy. SAIC’s partnership with C3, on the other hand, sounds like it could combine energy services and smart grid know-how in a way that could set it up for competition with the likes of Schneider Electric and ABB. Schneider bought energy services company Summit Energy in 2010 with the aim of giving building owners more tools to manage the way they buy and use power, and its acquisition of smart grid technology vendor Telvent and the distribution grid business of Areva has given it more tools on the grid side of things. ABB’s purchase of software vendor Ventyx, in its turn, has given the Swiss grid giant lots of energy forecasting, market integration and demand management software tools that it’s deploying in support of utilities, Derek Porter, executive vice president of product management and strategy, told me in a Wednesday interview. That includes retail electricity providers in deregulated markets like Texas and New England, which buy and sell power in ways that might be compared to large industrial and commercial clients. --Getting smart grid devices and networks to interoperate is a key theme emerging at this year’s DistribuTECH, and we’ve seen a number of announcements on that front in the last few days. On Wednesday, grid giants Alstom and S&C Electric Co. announced a “layered intelligence solution” that combines Alstom’s distribution management system and S&C’s automatic restoration gear. The idea is to let automated equipment repair grid problems as quickly as possible, while also letting grid operators know what’s happening and how they can intercede to assert central control. Combining the strengths of both styles of grid management will be key for companies like Siemens, ABB and General Electric as they compete for the next wave of distribution automation projects.